While it is yet to be new year in the rest of the world, it has already dawned in New Zealand and Australia. 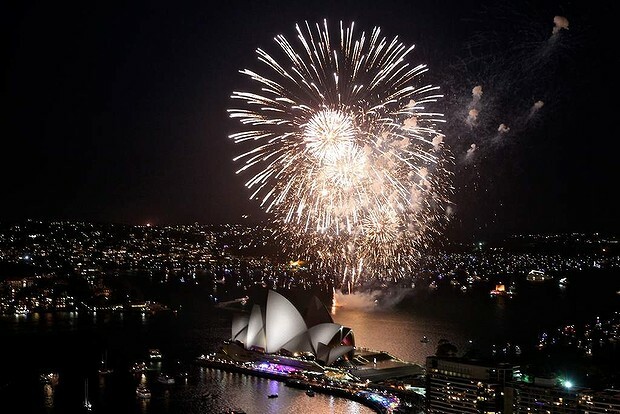 The Sydney harbour was the traditional venue of the fireworks which was watched by som e1.6 million people - a gathering larger than the usual gatherings in Paris, London, Berlin and New York, said the City of Sydney. Seconds before midnight Kylie Minogue pushed the button to launch a countdown and a remix of her song On a Night Like This blared out. Minogue, who was the creative ambassador for Sydney's New Year's Eve, had designed a firework in the shape of a musical note. At the end of the show Mr Foti released canon after canon, the bangs following at such short intervals that the colours washed together. The Prime Minister, Julia Gillard, issued a new year message heavy on policy detail. She mentioned the economy, health and aged care, climate change, the United Nations Security Council, North Korean missiles, global terrorism and Afghanistan.